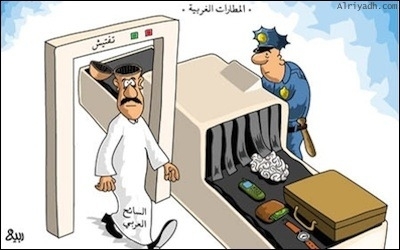 Detecting Islamists who enter Western countries, as one cartoonist suggests, requires knowing what's in their minds. When Donald Trump in December called for "a total and complete shutdown of Muslims entering the United States," I replied that changing just one word – "Islamists" instead of "Muslims" – would transform his outrageous and dead-end effusion into a politically feasible and operationally viable policy idea. In response, came this valid question from readers: And how does one distinguish between Muslims who are Islamist from those who are not? This is a very doable task, though an expensive, time-consuming one demanding great skill. By Islamists (as opposed to moderates), I mean those approximately 10-15 percent of Muslims who seek to apply Islamic law (the Shari'a) in its entirety. Islamists, not all Muslims, are the modern barbarians; they, not all Muslims, must urgently be excluded from the United States and other Western countries. Islamists, not all Muslims, must urgently be excluded from the U.S. and other Western countries. Both in-depth research and intensive interviews are needed before allowing aliens into the United States. The process should start with an inquiry into the prospective immigrant's family, friends, associations, employment, memberships, and activities. The immigration services should look for anomalies, gaps, questionable activities, and dubious relationships; when it finds these, it must probe them. It's no longer just public figures such as intellectuals, activists, and imams whose thinking can be traced, but most everyone, thanks to the proliferation of social media (Facebook, Twitter, etc. ), plus the Internet's open invitation to everyone to comment in writing or on video in a permanent, public manner. Recorded: With the permission of the person being questioned, the exchange should be visibly videotaped so the proceedings are known to be on the record, with the interviewee's words, tone, speech patterns, facial expressions, and body language all available for further study. Form matters: does the interviewee smile, fidget, blink, make eye contact, repeat, sweat, need repeated toilet breaks, or otherwise express himself in non-verbal ways? Polygraph: Attaching the interviewee to a lie detector might induce truth-telling, even if the machine does not, in fact, provide useful information. Effective screening requires case officers knowledgeable about Muslim societies and religious beliefs. Specific: Vague inquiries along the lines of "Is Islam a religion of peace? ", "Do you condemn terrorism?" "How do you respond to the murder of innocents," depend too much on one's definition of words like peace, terrorism, and innocents to help determine a person's outlook, and so should be avoided. Instead, questions must be focused and exact: "May Muslims convert out of Islam, whether to join another faith or to become atheists?" Variety: For the questions to ferret out the truth means looking for divergence and inconsistency by asking the same question with different words and variant emphases. Repeated: Questions should be asked again and again over a period of weeks, months, and even longer. This is crucial: lies being much more difficult to remember than truths, the chances of a respondent changing his answers increases with both the volume of questions and the time lapse between their being asked. Once inconsistencies occur, the questioner can zero in and explore their nature, extent, and import. This interviewing protocol is extensive, asking many specific questions over a substantial period of time using different formulations, probing for truth and inconsistencies. It is not quick, easy, or cheap, but requires case officers knowledgeable about the persons being interviewed, the societies they come from, and the Islamic religion; they are somewhat like a police questioner who knows both the accused person and the crime. Any one of the questions can be asked in different ways and expanded with follows-up about the respondent's line of reasoning or depth of feeling. This is not a casual process. There are no shortcuts. In short, truly to protect the country from Islamists requires a major commitment of talent, resources, and time. But, properly handled, these questions offer a mechanism to separate enemy from friend among Muslims.